Last week we had an opportunity to go to Idaho, to perform a family wedding. We chose to drive, rather than to fly, as it gave us time to be tourists along the way. Our route took us by Salt Lake City. If you go to Salt Lake City, you need to see the city's two big attractions, right? The Great Salt Lake, and Temple Square (site of the Church of Jesus Christ of Latter Day Saints' (LDS) temple). Here's a funny thing about Salt Lake City. Wouldn't you think they would have signs up, pointing people to their two main draws? For Temple Square and the Lake, we saw one sign for each. Just an Interstate highway sign pointing to an exit. From there on, no signs. No directions. I asked local people, and they could not give me directions! Sure, you can see it from I-84, but how do you get to its shore? Is Salt Lake City, and the state of Utah, somehow ashamed of these places? Our GPS came up with "Temple Square" when we punched it in. We drove to the site, and found it surrounded by a fence that could not be entered. The only way in that we saw was the visitor's center, where apparently you could take a guided tour. And the guided tour was the only way you could see anything if you are not an LDS member. And even then, there are areas you cannot see at all. Whether or not that is totally correct, that is the impression you get. While the LDS temple was a beautiful structure to look at, the Utah state capital building on the hill above it was much more impressive. And it's accessible. My wife has a personal tradition. She likes to dip her toes in any major body of water we visit. She has dipped in many rivers, lakes, and a couple of oceans. To keep her tradition, she wanted to dip her toes in the Lake. Water level was down, so the best place we found was a boat ramp. We were wearing shoes that we didn't want to ruin by crossing a long salt beach. this is a light day. (Pic byLee Rentz. As we approached the water, we saw the Great Salt Lake for what it really is, a giant cesspool. Everything runs in, but nothing runs out. Get that? Everything in. Nothing out. The water where we were was coated with a slime made up of oil and who knows what else. The bottom looks brown, but not the "clean" brown you normally think of with a sandy bottom. 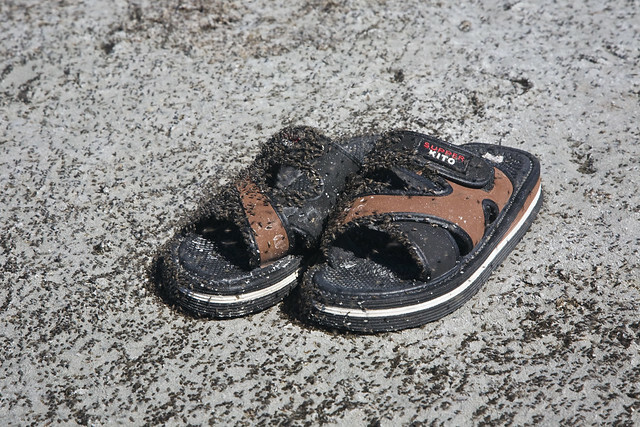 And there are literally billions of little black flies lining the shore, making it look black. In some places a dozen or more feet across. In the visitor's center we learned these are called "brine flies." They're harmless. They feed on an algae that grows in the salt water. The only other real life form is brine shrimp, which also feeds on that algae. The area is proud of one thing. The Lake attracts a multitude of gulls and shore birds. Some have their greatest populations right there. Actually, it's not the Lake that attracts them. It's the flies and the shrimp. Cheryl had to build up courage to dip her toes in this filth. Finally, she resolved to do it, but instructed me to take the picture quickly. When we got back to the car, she pulled out disinfectant wipes and washed her foot thoroughly. Then it occurred to me. God led the Mormons to Utah. It's a sign for all of us. They and the Great Salt Lake belong together.